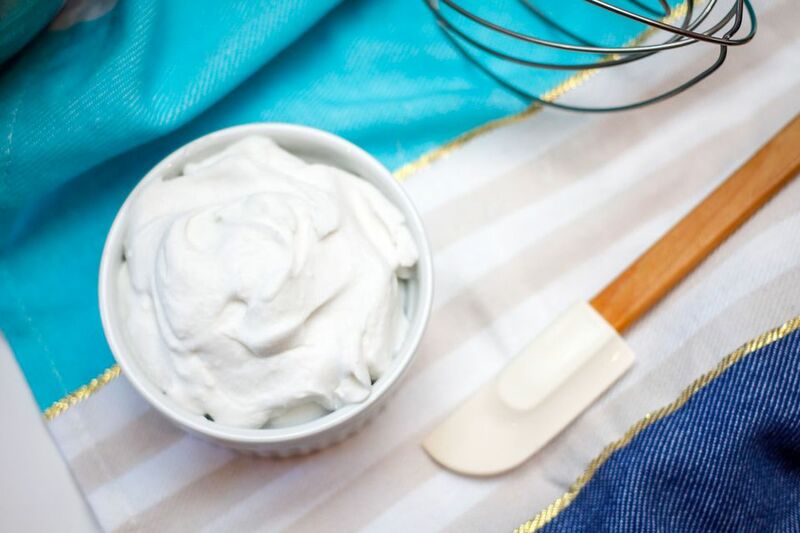 This dairy-free whipped cream recipe is really simple and easy to make. It's perfect for vegan desserts or for those with a dairy allergy or intolerance to lactose. Prepared with coconut milk instead of heavy whipping cream, this vegan whipped cream recipe is healthier, too! But pay attention to the little details -- they're key to the best results. Here's a fact that may encourage you to switch over to dairy-free whipped cream today: there are over 400 calories in a cup of sweetened dairy whipped cream, and almost 90 percent of those calories are fat. Two percent are protein. Incidentally, several of the higher-end grocery chains have now added lines of dairy-free frozen desserts that for all practical purposes come across as delicious ice cream. Trader Joe's, for instance, has a line of coconut milk based frozen desserts in strawberry and chocolate. These, like most desserts, are fairly high in both calories and fat content, but ​they're better for you than ice cream. You can top these frozen desserts with your vegan whipped cream for a truly delicious but slightly less indulgent way to finish a meal. Place the coconut milk (in the cans) along with the mixing bowl and whisk attachment from a standing mixer in the refrigerator for 8 hours or overnight. Working quickly is key to keep your ingredients from getting warm. Attach the whisk attachment and mixing bowl to the standing mixer immediately before preparing your whipped cream. Puncture the coconut milk cans with the pointed end of a can opener and drain and discard the liquid from the cans. Once the liquid is drained, open the cans and scoop out the coconut fat from the cans into the chilled mixing bowl. Whip the coconut fat on high speed for about 15 to 20 seconds, or until just smooth. Use vegan whipped cream immediately or store in the refrigerator for up to 3 to 4 hours before use. Also, make sure that your mixing bowl and all your ingredients are completely chilled before whipping up your vegan whipped cream -- that's really important. The refrigerated cream will help to create better stiff peaks. Essentially, the fat globules stick together to support the foam created by whipping air into the cream. For the very best results, leave both the coconut milk, your mixing bowl, and the whisk attachment in the refrigerator overnight.